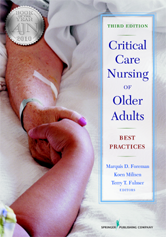 This book is an evidence-based, best-practices guide that directs the bedside care of critically ill elders. The book serves as a reference on major clinical issues for nurses working at the forefront of care-from nurses in critical care and step-down units to those in trauma and emergency departments. Nurse educators at all degree levels will also find this book to be useful as a textbook and resource for students. The authors provide evidence-based, practical guidelines for both the complex clinical and management aspects of care.